The End of America is not some grand political statement – it is a band of friends, singers and travelers who blend three-part harmony with rock and americana. The Philadelphia-based trio achieves a style that resonates with fans of Ryan Adams, CSNY, and Dawes. The band has released two EPs and a single since their inception in 2010. The End of America has performed at festivals including SXSW (BrooklynVegan showcase), Savannah Stopover, Baltimore Folk Fest and shared the stage with Beck, Anthony Green, Gary Louris of The Jayhawks and Rocky Votolato. All frontmen of previous bands, Brendon Thomas, James Downes and Trevor Leonard met on tour in 2005. They went on to form a trio that highlights their vocal chemistry and captures the raw honesty of their performances. Both of the band’s recordings, “Steep Bay” and “Shakey,” were tracked live with minimal takes. In February 2013, The End of America joined Beck in Los Angeles for his “Song Reader” sheet music album release show. Beck discovered TEOA by way of a YouTube video of the band’s interpretation of the song, “Please Leave a Light On When You Go.” The trio’s performance aired live on KCRW and received praise from Spin Magazine, Filter and The Hollywood Reporter. 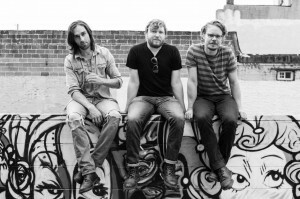 TEOA spent 2013 on tour in support of their EP “Shakey” and recent single, “Silver AM.” The band is currently working on their debut full length album, due out fall 2014. The End of America has performed alongside such artists as Beck, Good Old War, Gary Louris of The Jayhawks, Rocky Votolato, Anthony Green, Adam Green of Moldy Peaches, Laura Stevenson, Kevin Devine, Cassino, Teddy Thompson, Fink, and Seth Glier.